Superheroes. One of time’s oldest archetypes has risen to a point of cinematic success never dreamed possible in the realization of comic-book inspired superhero movies. While there is now a rich tapestry of hits in the comic book movie genre, never before has a franchise achieved the stature and box office success as what we commonly refer to as the Marvel Cinematic Universe. Yes, the thirteen movies thus far that we refer to as the M.C.U. was a dream in the minds of the producers at Marvel Studios. Taking all of the best of the properties they hadn’t already licensed to other film studios, they bundled them together in one shared universe culminating in their phase one masterstroke, The Avengers. These movies—thus far—have grossed over 10 billion dollars worldwide. No kidding, not even the Star Wars, Harry Potter or James Bond franchises have done so much business at the box office. Early on, many were skeptical that Robert Downey Jr. could carry a story like Iron Man featuring a character not as beloved as Spider-Man or Wolverine, but now, just about everything the newly christened Marvel Studios puts out becomes critical and financial gold. Truly producer/impresario Kevin Feige and the litany of writers, directors and actors that have toiled these last eight years have the Midas touch. Each time it looks like a failure is imminent, yet they find another twist to the proceedings and expand their universe just one step more. Paul Rudd as a wisecracking hoodlum Ant-Man? Done. The “Guardians of the Galaxy” writ large as a colorful space rock opera. You betcha. So eight years in, we now find ourselves at the fourteenth outing of this cinematic universe. Cynics will truly think Marvel is now out in the weeds as we now have a full-length feature film featuring the one and only sorcerer supreme himself, Doctor Strange. Those unfamiliar with comic book granularity will be surprised to learn that the character Doctor Strange, created by Steve Ditko, was one of the vintage classic silver age of Marvel comics earliest real successful characters in the ‘60’s. The good news is—somewhat unsurprisingly at this point—that Doctor Strange, as helmed by director Scott Derrickson, is wonderful. Marvel has done it again. First of all, Doctor Strange boasts a truly A-list cast. Rarely are so many actors typically scene in Oscar-caliber movies found all at once in the same superhero movie. The incredible Chiwetel Ejiofor (Children of Men, 12 Years a Slave) portrays as Mordo, one of the sorcerers that helps the main character find his way to his powers. Ejiofor’s performance is the one that undertakes the greatest transformation between the first time he’s seen and the film’s final frame. Not to be outdone, Marvel pulled off a coup and cast the incomparable Tilda Swinton as the venerable character, The Ancient One. Call it the corner man character for the story, Swinton is luminous in the portrayal, and effortlessly takes someone who has apparently lived thousands of years and simultaneously makes her charming, stern and filled with wild-eyed wonder. Benedict Wong (The Martian) appears as Wong, a character wisely updated from his comic book station as Doctor Strange’s household servant to be a humorless librarian with vast magical knowledge all his own, while Rachel McAdams (Spotlight) is also featured, playing Strange’s once lover Dr. Christine Palmer. And of course, the meteoric rising star Benedict Cumberbatch plays the main character, Dr. Stephen Strange. 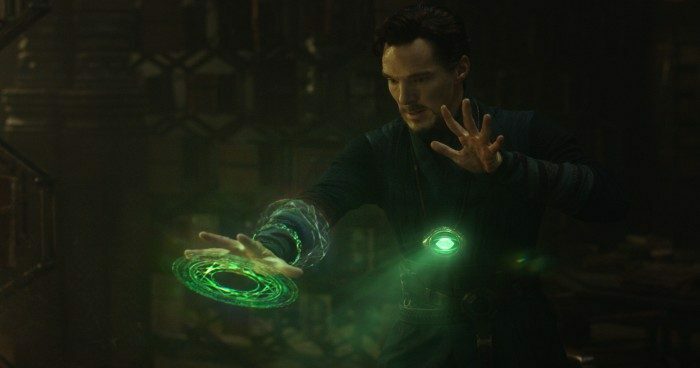 This is no small feat, as though it is true the character arc of the story bares a similarity to Iron Man and his self-obsessed alter eg Tony Stark, Stephen Strange is a character with far more nuanced goals and drives. Without an elaborate family history, we are dropped in to the point where Strange is essentially a master surgeon, able to pull of surgeries and spinal repairs with a skill and alacrity that almost no one alive can. It’s early on while unwisely driving and txt’ing (considering what life saving surgery can he pull off where he doesn’t stand any chance of failing) that he drives off a cliff and all but destroys his most valuable tool, his hands. When Western medicine fails him in repairing his body, a chance encounter points him eastward to find a mythic monastery named Kamar-Taj in Kathmandu, Nepal. It’s there where he meets Mordo and is introduced to The Ancient One. 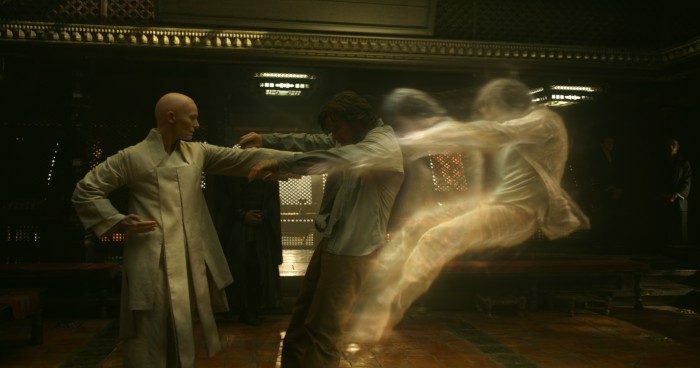 He’s predictably sarcastic and disbelieving in their gifts, but when The Ancient One abruptly sends him on a psychedelic roller coaster ride and forces him to instantly perceive that there are multiple dimensions, Strange quickly warms up to the idea of real magic. The real thrill in this story—like they very best origin stories— is seeing the hero piece-by-piece find his footing like a bumbling adolescent. To take a competent postdoctoral egotist and thrust him into a world where he’s as clumsy as a five-year-old is the backbone of the narrative arc; Derrikson is credited with penning the script alongside Jon Spaihts (Prometheus) and C. Robert Cargill (Sinister). The audience is thus allowed to revel in taking the journey with him and seeing how he learns to be something much more than a skilled surgeon. Cumberbatch excels in taking these small steps, bringing a self-serving narcissist into someone actually interested in magically protecting the world (and the multiverse). It’s here that Mads Mikkelsen (Casino Royale) is introduced as the wayward sorcerer Kaecilius. We’ll spare you any of the finer points of the plot as the journey through this and the discovery of what is happening is a large part of the fun of this story, but suffice it to say Kaecilius has darker ambitions with uncertain results for everything, everywhere. The conflicts Doctor Strange, Mordo and The Ancient One have against Kaecilius are a visual feast. It’s hard to know where cinematography ends and VFX begins but somewhere in the hands of Ben Davis, Stephane Ceretti and Paul Corbould (cinematographer, visual effects supervisor and special effects supervisor respectively), the entire experience becomes a moving, vibrant, M.C. Escher-inspired 3-D world on crack. As the characters slip between the Astral Plane and the Mirror Dimension, walls twist and contort, reality folds in on itself and changes direction, even time itself bends. So with that, the movie completes the trifecta of superb acting, mind-bending visuals and an enriching story based on magic that unfolds convincingly. That’s the real treat here, seeing how the world we know and the reality we understand becomes something the characters can bend and manipulate at will. When it’s not just simply punch, kick, shoot, the magic-filled world they operate in presents an almost endless amount of action possibilities. 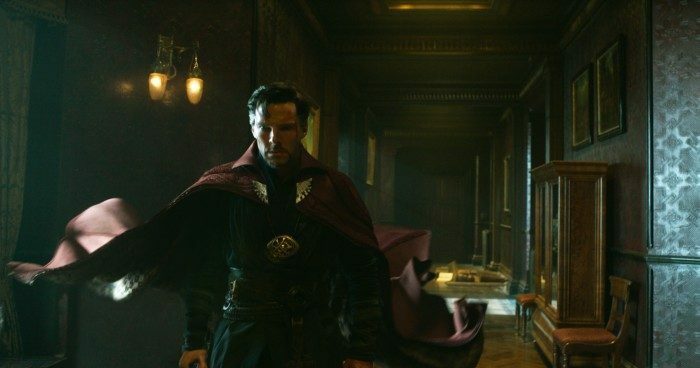 Various magical weapons also become prominent pieces of what drive the plot, but keep a look out for Doctor Strange’s cape. That one element is a hoot all in itself and is planned out so well it could almost be another character. Naturally, there is something supremely ominous lurking where we as humans aren’t aware of, but you have to see this film to know how it fits into the bigger picture of what Marvel is planning. There is a connection in this story to their larger master plan, but you’ll want to watch and listen carefully as the story draws to a close. 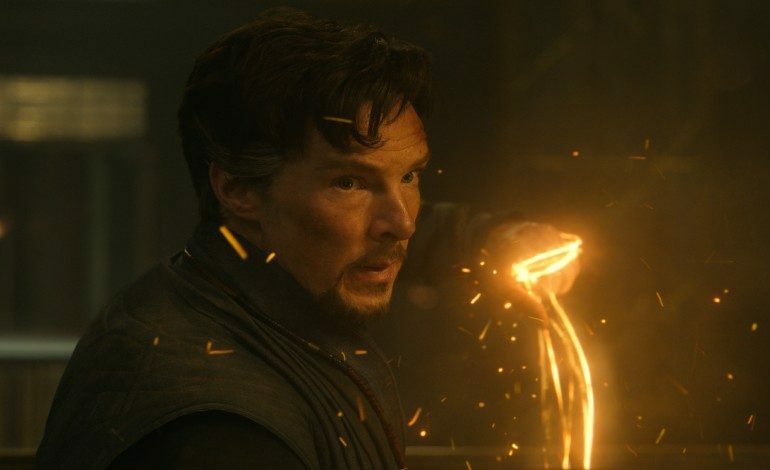 What’s not to like about Doctor Strange? This movie has a killer cast, excellent story (co-written by Jon Spaihts, Scott Derrickson and C. Robert Cargill), stupefying visuals and is generally just a wicked fun experience. It may not have the poignant “oomph” that Captain America: Civil War aimed so high with, but this is another sterling example of Marvel’s crack storytelling and world making. Both casual fans of action movies and superhero aficionados both will love this movie.